The sun is setting on humanity. The night now belongs to voracious demons that arise as the sun sets, preying upon a dwindling population forced to cower behind ancient and half-forgotten symbols of power. These wards alone can keep the demons at bay, but legends tell of a Deliverer: a general -- some would say prophet -- who once bound all mankind into a single force that defeated the demons. Those times, if they ever existed, are long past. The demons are back, and the return of the Deliverer is just another myth . . . or is it? 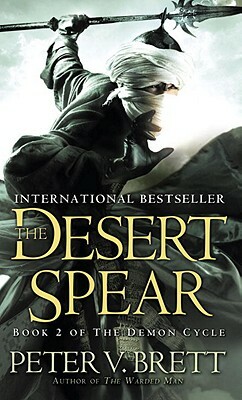 Out of the desert rides Ahmann Jardir, who has forged the warlike desert tribes of Krasia into a demon-killing army. He has proclaimed himself Shar'Dama Ka, the Deliverer, and he carries ancient weapons -- a spear and a crown -- that give credence to his claim. Sworn to follow the path of the first Deliverer, he has come north to bring the scattered city-states of the green lands together in a war against demonkind -- whether they like it or not. Once the Shar'Dama Ka and the Warded Man were friends, brothers in arms. Now they are fierce adversaries. Caught between them are Renna, a young woman pushed to the edge of human endurance; Leesha, a proud and beautiful healer whose skill in warding surpasses that of the Warded Man himself; and Rojer, a traveling fiddler whose uncanny music can soothe the demons -- or stir them into such frenzy that they attack one another. Yet as old allegiances are tested and fresh alliances forged, all are blissfully unaware of the appearance of a new breed of demon, more intelligent -- and deadly -- than any that have come before.